I watched the Cloud Atlas last weekend and it didn’t disappoint. Not that I read the book – my ‘pre movie excitement’ was entirely based on seeing the trailer and the words ‘everything is connected’ which I happen to know is true. The Cloud Atlas is about a group of souls who keep reincarnating together in different constellations… sometimes as friends, sometimes as family members or colleagues. If you’ve ever had the experience of meeting someone for the first time and knowing that you already know them, you will understand this concept without straining your brain too much. Important work has been done by Dr Michael Newton in terms of finding out where we go between lives/incarnations and according to all the clients he interviewed in deep trance states, we always go back to be with our soul group. Then, before we are sent back to earth (or another planet), we set up a contract with souls from that group. These contracts are there to help us grow and challenge us in different ways… and sometimes we get to repeat lessons we didn’t quite manage the last time around. 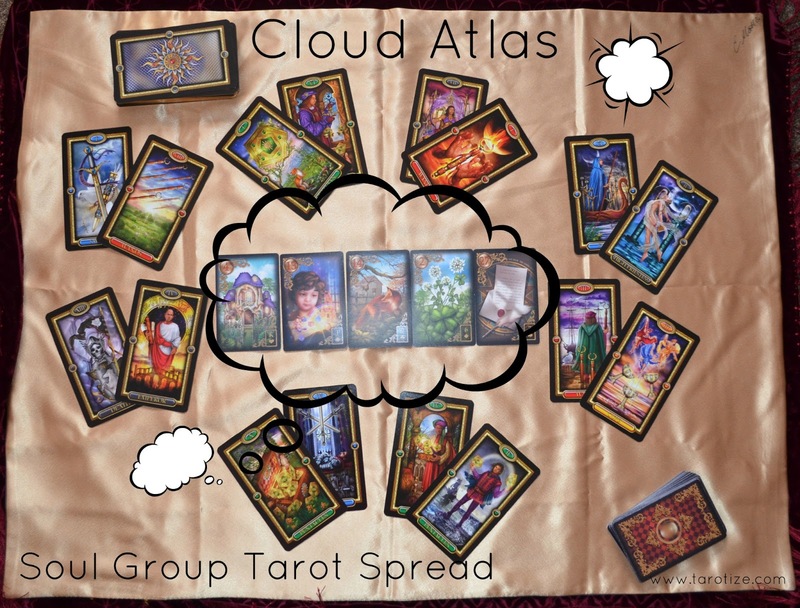 Inspired by the film, I decided to create a cloud Atlas spread with 8 of the people I feel I may have a soul contract with in this incarnation (but you can adapt this spread with as few or as many connections as you wish). I wanted to make this spread rather free-form but in the end it seemed logical to place those who are already in heaven above, those who are part of my earth family below, those whose influence is waning or who belong to my past to the left and those whose influence is waxing and I’m just getting to know to the right. For each soul group member connection, I have pulled one card to represent the nature of our connection and one to represent the lesson/challenge in this lifetime. In the middle I have left a space to lay out either a three card Tarot story spread or a Lenormand row of five for each of the soul group member connections you want to take a closer look at. If you do use a Tarot story spread, I recommend using a second deck for this! In the picture above, I have used the Gilded Tarot Royale together with the Gilded Reverie Lenormand, both by Ciro Marchetti. Some stunning revelations were had! Have fun trying this out for yourself!